QS is an important international institution responsible for the classification of universities around the world. Dr. Noor Aldeen Atatreh, Al Falah University Chancellor and Prof. Abdelhafid Belarbi, President met with Mr. Nunzio Quacquarelli, CEO of QS and Mr. Ashwin Fernades, Regional Director of QS MENA. Dr. Atatreh stated during the meeting that the university is seeking to take all measures that would raise the university's rank, noting that AFU gives great importance to scientific research and encourage faculty members to participate in various international conferences. Prof. Belarbi, on the other hand, said that AFU organizes an annual meeting for all faculty members to remind them of the international standards of QS MENA in ranking universities. 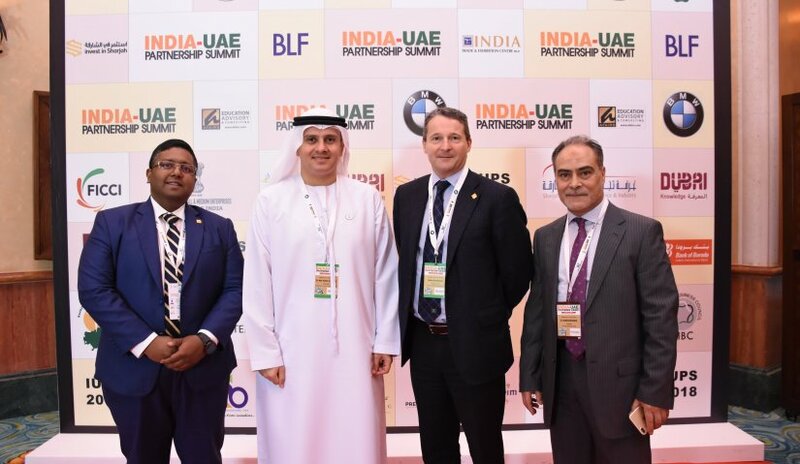 The meeting was part of the UAE-India Partnership Summit held at the Atlantis Hotel, Palm Jumeirah. The conference highlighted important sectors including education, small and medium-sized enterprises, skills development and manpower recruitment in cooperation with four Indian states: Assam, Delhi, Punjab, and West Bengal.